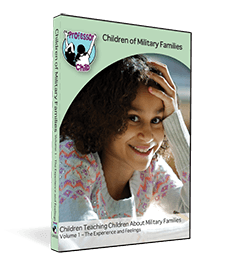 In Professor Child’s Children of Military Families film series, children teach others what its like to have a parent deployed in the military by sharing their personal stories. We hear what deployment means to them, the struggles they have faced, and how they have worked through challenging times. The authentic advice they offer will leave viewers with a sense of hope and an understanding that they are not alone in experiencing the deployment of a loved one. Each volume includes a companion CD-ROM workbook with numerous discussion questions and creative exercises corresponding to the film. In Volume 1, The Experience and Feelings, chapters include My Story, Deployment, We are Unique, and The Good and The Bad. In Volume 2, Ways To Cope, chapters include What Helps, Advice to Kids, and What I Would Change. In Volume 3, Homecoming and Military Pride, chapters include Homecoming, Advice to Parents, If I Had a Magic Wand, What Makes You Proud, and I Am. 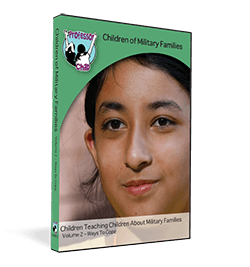 The Children of Military Families curriculum workbooks include numerous thought provoking discussion questions and creative exercises. Each workbook is broken down into chapters that correspond with each film. 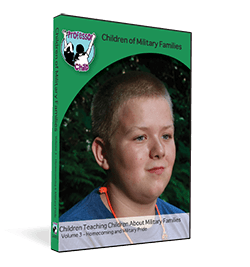 If you are interested in streaming the Children of Military Families film series or individual volumes for an event or private screening, please contact us. The National Parenting Publications Awards (NAPPA) recognizes Children of Military Families with a bronze award. Read the review here. Service and sacrifice never sounded so real… watch for yourself… prepare to feel their stories. Honestly and quite candidly, these precious children share their feelings, give advice to peers as well as to parents, tell us what they do if they had a magic wand, and describe themselves and their experience. And it’s a powerful 46 minutes!